Its hard to be objective when a band personally dedicates a song to you by name from the stage of Bowery Ballroom, but The War On Drugs show at Bowery was beyond the need for personal puffery. At an hour and forty minutes, and including in the setlist virtually everything the band has recorded, this War On Drugs set was epic. While David Hartley’s bass guitar has always been the backbone of the live band and his work on this night was superb, its hard to fathom the extent of the confidence and maturity that has Adam Granduciel now exhibits. Throughout the show, Adam’s delivery of each song was intense. While the band has reached a level of proficiency that often follows groups that tour extensively, the recent success seems to have propelled their energy to the next level. Opening with the double whammy of “Arms Like Boulders” and “Baby Missiles”, the momentum never let up. Slave Ambient was universally acknowledged as one of the best albums of 2011, and its prominence in the song selection was no surprise. But it was the development of the songs in the live setting that impressed — “Your Love / Animator / Come To the City” is now a twenty-plus minute segue, while “Best Night” (streaming below) is now charged up enough to be the next song that WOD plays on television. The show would not be complete without an inventive cover, and on this night it was from the Scottish indie troubadours The Waterboys, the classic “A Pagan Place” (also streaming below). The War On Drugs will be active on the Festival circuit this Spring and Summer, dates are here. I recorded this set from our standard balcony location with the Sennheiser 8040s mixed with an outstanding board feed and the sound quality is superb. Enjoy! If you email nyctaper for access to this recording, we expect that you will PLEASE SUPPORT The War On Drugs, visit their website, and purchase their new album Slave Ambient from Secretly Canadian Records [HERE]. 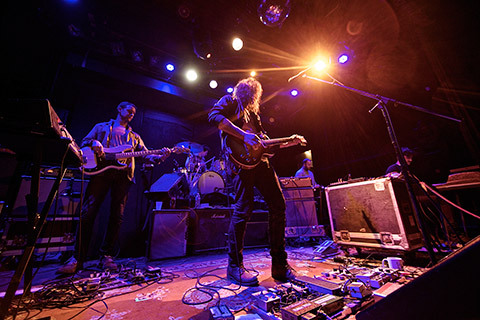 It was slightly less than a year ago that an opening set at Bowery Ballroom by The War On Drugs so floored us with its intensity and purpose that we vowed never to miss them again. They have been on NYCTaper four times this year, and have quite literally never disappointed. At Bowery on Sunday night, it was the band’s headlining coming out party and the sold-out crowd were treated to another taste of excellence. War On Drugs latest album Slave Ambient has earned them universal praise, and the set contained 6 of the albums twelve songs. “Baby Missiles” is arguably the strongest track on the record and we’re streaming it below. War On Drugs will be performing the track on Jimmy Fallon on January 10th — their late night tv debut. We are also streaming an interesting cover of the Grateful Dead’s “Touch of Grey”, a song that represents that band’s only certifiable hit, and a cover where the War On Drugs turns the song into their own, never veering too far in the direction of tribute or parody. 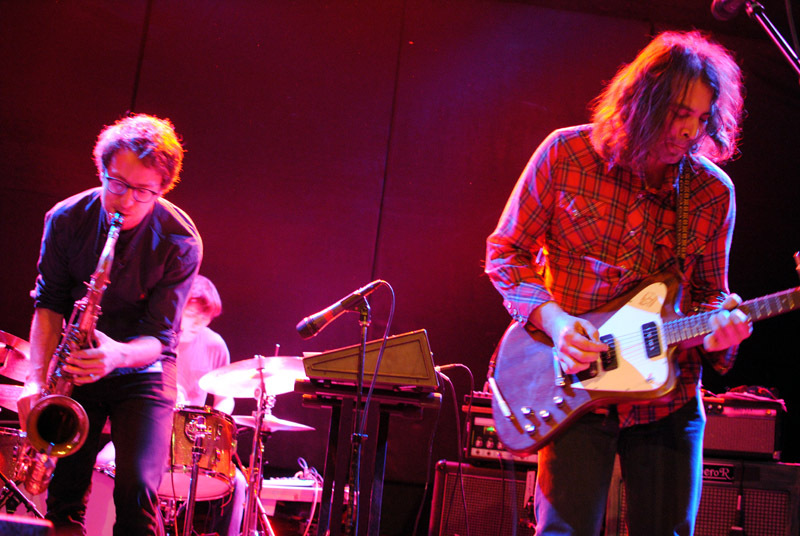 The War On Drugs will return to NYC for a show at Music Hall of Williamsburg on April 8. I recorded this wet with the four mic rig from the balcony rail and the sound is excellent. Enjoy! This show is now available for download in FLAC and MP3 on Archive.org [HERE]. The War On Drugs released Slave Ambient this past week. Its an album that’s been in the works for a couple of years, since the 2008 release of their excellent Secretly Canadian Records debut Wagonwheel Blues. But in a way, its an album that’s been waiting much longer for its release. The band’s leader Adam Granduciel incorporated some older songs into the album and spent many months tweaking the mixes, reworking arrangements, and perfecting what will undoubtedly become one of 2011’s best albums. When we recorded The War On Drugs in January, the new songs were beginning to take shape, but when the album versions were released, the positive developments were striking. On Friday at Cameo Gallery, The War On Drugs performed a superb ninety-minute set that consisted primarily of Slave Ambient material — eight of the album’s twelve songs were played. Of the new songs, the second-slotted “Baby Missiles” was particularly tight and focused and we’re streaming it below. Other highlights included the jammed transition from “It’s Your Destiny” into “I Was There”, and the eighteen-minute encore of “A Needle In Your Eye #16” with an extended guitar and sampled-driven ambient jam. The War On Drugs will be touring throughout the Fall. While they are on a current East and Midwest swing, they will tour Europe in September, and return to the US in October. I recorded this set with the Neumann microphones mounted in the center of the room in front of the soundboard booth and raised to 12 feet. The room mics were mixed with a mono board feed to accentuate the vocals, and the sound quality is superb. Enjoy! I like to think we have a pretty solid record here at nyctaper of predicting future success for emerging artists — particularly those of the female persuasion. Admittedly, we’ve jumped on the already moving bandwagons of Holly Miranda and Nicole Atkins, but in recent years we’ve sung early praises for current movers such as Jessica Lea Mayfield, Alela Diane and of course Sharon Van Etten. A few months ago we foresaw the current success of Tristen. Last week at Music Hall and Bowery, our new can’t-miss performer Little Scream opened two shows for the Antlers and proved why her April-release debut album The Golden Record (Secretly Canadian) is already an album of the year contender. Little Scream began as the solo recording project for US ex-pat and currently Montreal resident Laurel Sprengelmeyer but at the recent performances she was joined by a crack band which included along with the standard band format, a flutist and synthesizers. At Bowery, the Little Scream band worked through much of the new album in order, skipping only a couple of the quieter numbers. We’re streaming a very strong version of “People Is Place”, which begins as a melodic solo guitar number before tasteful additions from the band complete the narrative. Lauren chose to end the set solo with a poignant new number (“Letter”) that she appropriately dedicated to her cohort and fellow riser Sharon Van Etten. I recorded this set with the exact setup as the Antlers set and the sound quality is superb. Enjoy! 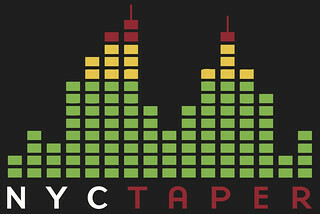 If you download this recording from NYCTaper, we expect that you will PLEASE SUPPORT Little Scream, visit their website, and purchase The Golden Record from the Secretly Canadian Records website [HERE].